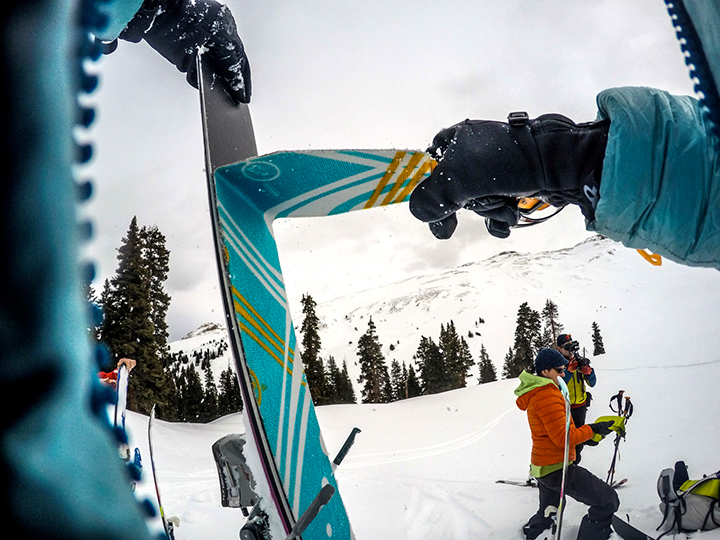 Join Chicks and the Silverton Avalanche School for our 1-day intro to backcountry skiing skills clinic focused on learning the ups and downs of backcountry skiing and splitboarding. This day out is designed for both newcomers to the backcountry and seasoned skiers and riders looking for a tune-up on technique to make backcountry travel more efficient and enjoyable. Our Chicks Guide will share their decision-making process with you from the day’s start to finish, giving you insight into how to find “the goods”, how to stay comfortable in the backcountry, how to manage clothing and equipment in adverse conditions and tips for keeping your energy up and calories in. They’ll be your coach, instructor and champion to get you out in front, making fresh tracks up and down. And true to all Chicks programs the fun factor and supportive nature of our trips puts everyone at ease and ensures a good time. We meet at 7:00 a.m. in Ouray at the Guide Garage for coffee, get our equipment sized up and sorted out before our van shuttle picks us up for the stunning drive up Hwy 550 to Red Mountain Pass. We’ll end the day with a van shuttle back down to the Guide Garage where we’ll celebrate and high five over Happy Hour hors-d’oeuvres and a beverage. Who would benefit from taking this Program? Or Any backcountry skiers and riders with a few days under their belts and have interest in learning best practices.